Do you have any favourite movie/example from recent years that you think manage to create that dream-feeling as good as Hitchcock did? Nice list of dream sequences. I'll watch them later. A very nice list indeed. Of your examples I esp. like the "dream" in The Machurian Candidate which is no dream at all. But like Fiffi I'm curious about more recent exampels as well. 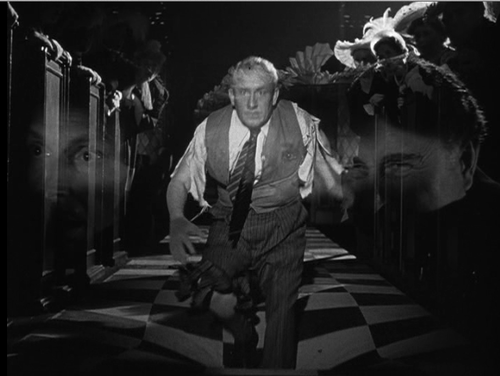 I remember that the one from Wild Strawberries scared me a lot as a child. And that feeling is lingering. The thought of a watch without pointers makes me very uncomfortable. I did not spontaneously think of any new films when making the list. Not that there are none, just that I couldn't think of any. But there is one dream sequence in The Ghost and the Darkness (1996), with a queer subtext even, and there are several in the Coen Brothers A Serious Man (2010). But they are not surreal like those above. Someone who is good at creating a nightmarish atmosphere without it actually being a dream is David Fincher, who is in same ways a contemporary Frankenheimer, combined with Alan J. Pakula. Visually extravagant urban paranoia. Great list (not that I've seen all the films). I thought the Wild Strawberries one actually was the best thing with that whole film. :) Wasn't there a dream sequence in Fängelse as well? David Lycnch? Not your cup of tea? Yes, there's a great dream sequence in Prison, and other Bergman films as well.